West Australian superyacht builder Echo Yachts is proud to announce they will be exhibiting their recently delivered 46m Expedition / Shadow Vessel ‘M/Y Charley’ at this weeks exclusive Singapore Yacht Show. 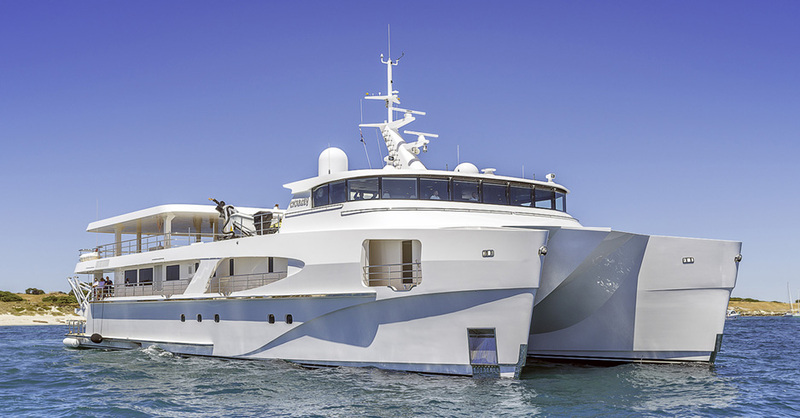 M/Y Charley is a custom designed and purpose built using the latest in 5 axis CNC and vacuum resin infusion manufacturing technology at Echo Yacht’s superyacht manufacturing facility near Fremantle in Western Australia. Charley is the largest composite resin infused vessel ever to be built in Australia, with Naval Architecture performed by LoMocean. The unique design of Charley provides extremely spacious interior and exterior accommodation entertaining areas, a very large carrying capacity for a plethora of tenders and other water toys plus superior sea keeping and fuel efficient performance. One of Charley’s most striking features is the large 12m custom carbon fibre tender catamaran with a specially engineered launch and retrieval platform positioned at the stern of the vessel. Charley also comes equipped with an emergency helicopter touch & go pad, dive store, decompression chamber and specialist sonar equipment for wreck finding and diving expeditions, to name but a few of it’s impressive features. The team at Echo Yachts specialise in the design and manufacture of bespoke Superyachts, Expedition and Shadow vessels tailoring each project to match their clients exacting requirements, style, features and performance. Echo Yachts are currently building an 84m aluminium trimaran superyacht styled by the renowned Sorgiovanni Design studio. The diesel electric superyacht is to be a world first, being the largest aluminium and largest trimaran superyacht built to date.